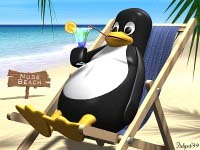 What was your first Linux kernel version? For me somewhere at 2.0.x, can't really remember but I started to understand how to use it at 2.2.x. I voted 0.0.1 although it probably was a version shorty after that that I first used. I remember it was a LOOOONG time before 1.0 came out (years) and it was a huge deal when it finally went 1.0. It only ran on a boot and root floppy disk when I started with it.